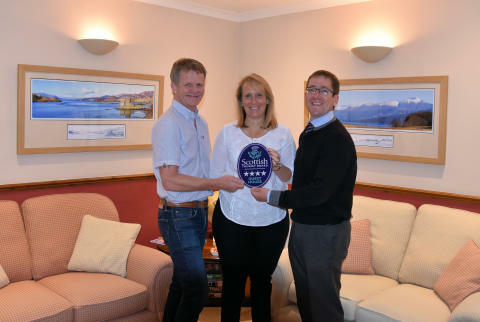 A west Highland guest house with stunning views across Loch Linnhe to the Ardgour Hills has been awarded a Four Star Gold Quality Assurance (QA) award from the national tourism organisation. Lochview House, which sits in an elevated position in the hillside above Fort William, has been run by Karen and Vince Dean since 2015. They bought the property in 2014 and have substantially invested in Lochview following advice and support from VisitScotland through its QA scheme. The ‘Gold’ part of the award represents the continuing attainment of outstanding customer service and hospitality. The property, situated in the Outdoor Capital of the UK, has five ensuite guest bedrooms (a number of which have loch views), two suites, a self-catering apartment and a guest lounge with a range of games, books and information on what to see and do in the local area. There is also a drying room, secure outdoor facilities for bikes or other equipment including skis, mature gardens with panoramic views and wildlife, free Wi-fi and private parking. Lochview is a 10-minute walk from the town or a 20-minute drive from Ben Nevis. Karen and Vince bought Lochview after visiting Scotland for many years and deciding to move to Fort William as they loved the area so much. 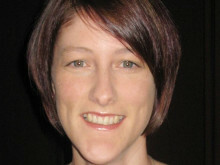 Karen said: “We are extremely proud to receive our Four Star Gold award from VisitScotland this year. When we moved to Fort William in 2014 we knew we wanted to make Lochview a haven for guests to come and explore the Highlands. “Our primary focus has always been offering excellent customer service as well as those lovely little extras like shortbread and tea on arrival and tartan teddies in our rooms. In addition, we also wanted to invest in making our guesthouse a homely atmosphere for guests to relax and enjoy their holiday. “With advice from VisitScotland, we completely refurbished our home with new bathrooms, the creation of two new suites and new furniture throughout the house. We are so happy our guests like what we offer and it's lovely to see many of them coming back to stay again and again in this beautiful part of Scotland. Developed over the last four decades in partnership with the tourism industry and informed by visitor research, VisitScotland’s Quality Assurance (QA) schemes are world-leading. Delivering a quality experience that meets and exceeds visitor expectations is crucial in making Scotland a must-visit, must-return destination. QA stars shown alongside online reviews give visitors a balance of objective and subjective views to assist in their decision making and expectations. Ken Massie, VisitScotland’s Head of Strategic Partnerships, said: “Karen and Vince should be congratulated on their attainment of this Four Star Gold award, which not only demonstrates a high level of quality but also the continuing attainment of outstanding customer service and hospitality. 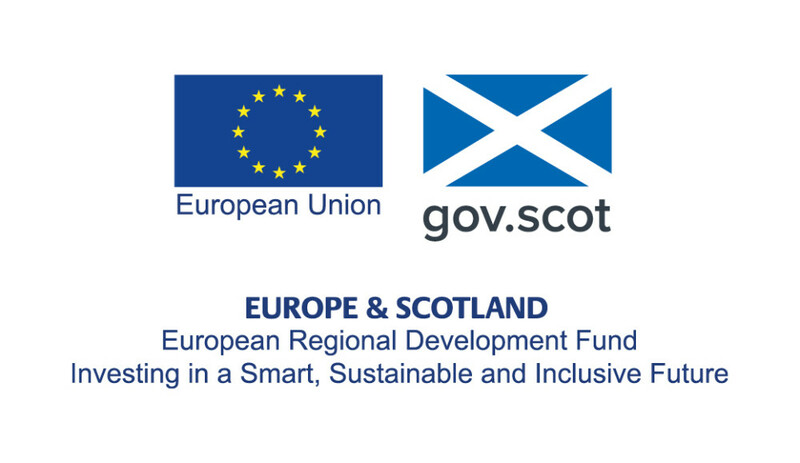 “VisitScotland staff were able to inform Karen and Vince about the most effective investments to make in their business based on experience, knowledge of visitor expectations and trends and understanding of best practice. 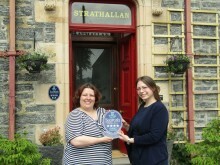 Ex-student hostel given tourism accolade. ​A family-run, historic Highland house has attained a coveted ‘Gold’ award to add to their four stars from the national tourism organisation. Fife farm receives tourism accolade.